My father would say, what's the use of having a beautiful home if your yard doesn't reflect the same. After all he would explain, your yard is actually your show place. People who really love their homes have beautiful lawns and flower beds. Many of them have their driveways lined with solar lights, bird feeders or wind chimes are hung from the trees and their flower beds are filled with flowers or shrubs. The question I have been asked since I happen to have a green thumb and happen to be an expert creating beautiful flower beds, is how do I get started? And where do I get my flowers and shrubs? Then there are others who are afraid to build their own flower beds because they are scared that they won't be able to grow or maintain them. For those people you are in luck because I am going to pass on to you some free advice and knowledge. If you haven't already had an established flower bed, the first thing you must do is find yourself a sheet of paper, then draw and outline of your home. First start in the front of the yard and then design one if you, like for your back yard. After you have done this sketch on that same sheet of paper then look or shape what you would like your flower bed to look like. When that is done is when the real work begins. Clear all grass or weeds away from the out line of your home, then line the outer edges with bricks such as cobble stone, pond stones or with something more natural like boarder grass. After that take a trip to a local nursery and order some dirt. The reason for this dirt or soil is because when one is building a flower bed for the very first time , most are elevated above the lawn. Also fresh dirt or soil from a nursery will almost ensure a healthy flower bed. I know there are some who may be reading this may say," Okay Chuck, now that is done what plants do I plant or what type will do well, grow or stay beautiful in my area? For those answers to your questions , all one must do is visit their local chain store, such as Lowe's or Home Depot and then there are the local nurseries which I really like. I recommend buying something that will come back year after year. Such as seed plants, annuals, rose bushes, fruit trees and shrubs. 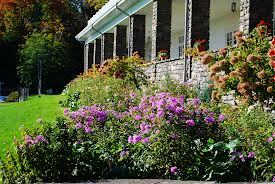 These plants will come back year after year despite the weather condition and they are very easy to maintain. As for as your yard is concerned, fertilize with weed and feed, once in the spring and once during summer, then if watered properly your yard will be beautiful for a season. If you follow my advice very soon you will be able to make your yard, your own personal paradise. For more advice, tips or suggestions, write in. My staff and I promise to answer all of your questions. Hey Chuck, I live in an apartment and I love plants. How do I get something green to grow, when I don't have a yard? Is it impossible to grow something beautiful in a flower pot? Being that you love plants, it will be easy for you to grow them and keep them beautiful. All plants these days get their start in flower pots. Some are grown in big pots, while others are grown in small ones. Go to your local store buy you a large pot, then visit your local chain or nursery and buy or purchase the flowers or plants that you like. Buy yourself a large bag of miracle grow, because this soil is very easy to maintain and your flowers or plants will grow. Fill up your pot or pots, three fourths of the way and take each plant out of their pots. Arrange them the way that pleases you and surround their roots with soil. Fill the pot up with the remaining miracle grow, while being careful not to cover anything green. Make sure your plants are at a proper dept and then apply water. Water once a week or when dry and your plants should continue to grow.